Gov. 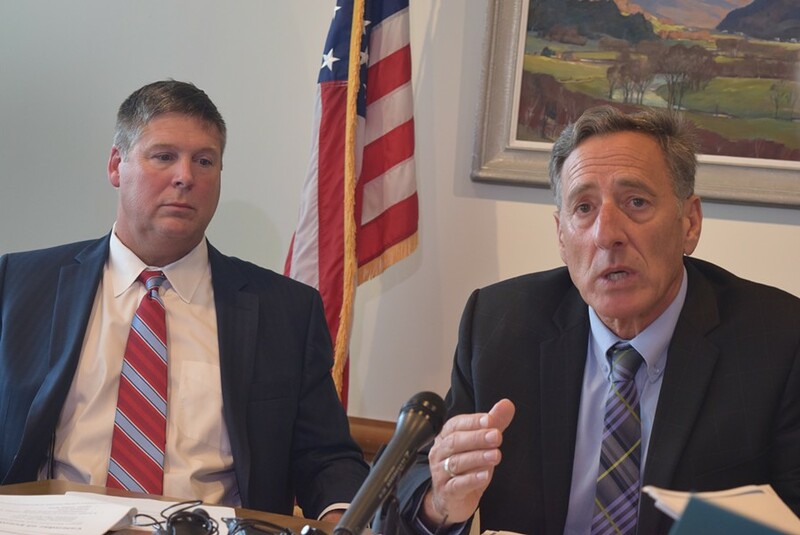 Peter Shumlin (right) and Green Mountain Care Board chair Al Gobeille discussing an all-payer waiver system for reimbursing health care providers. Vermont has won long-sought approval from the federal government for an “all-payer waiver” that is intended to change the way health care providers are reimbursed by government and private insurers, Gov. 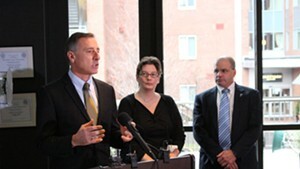 Peter Shumlin announced Wednesday. Doctors, hospitals and consumers have three weeks to weigh in on the plan before the state’s Green Mountain Care Board signs off on it. “It’s complicated,” Shumlin acknowledged of the plan, after his staff handed out piles of paperwork detailing the draft five-year agreement that’s been in the works for two years. Nonetheless, Green Mountain Care Board chair Al Gobeille said health care providers should be able to readily determine what they think about the plan. It’s not quite that easy, said Paul Harrington, executive vice president of the Vermont Medical Society, as he read the agreement Wednesday afternoon. He said many questions remain unanswered. Harrington said his organization will be encouraging doctors to study up and speak at upcoming hearings. The Vermont Association of Hospitals and Health Systems will also be burrowing into the details. Jeff Tieman, the group’s president and chief executive officer, expressed optimism that the waiver could help reduce costs. The five-member Green Mountain Care Board, which would have to approve the plan, has scheduled meetings and public hearings that will be held in quick order. The first meeting is at 1 p.m. Thursday at the board’s Montpelier office. A Chittenden County public hearing is expected to be held October 6. Gobeille insisted that though he was involved in negotiating the waiver with the federal government, his board has not decided whether to approve the plan. He and Shumlin said the state won’t go ahead with the agreement if Vermonters reveal it will be bad for them. The waiver is designed to pay health care providers set amounts for comprehensive care, rather than reimbursing them for each test, procedure or visit. It seeks to limit Vermont’s health care cost growth to 3.5 percent over the next five years, rather than the projected 6.6 percent. Gobeille and Shumlin insisted the waiver offers consumers the best hope for curbing rising health care costs. “This is probably the single thing that hurts Vermonters the most economically,” Shumlin said at a Montpelier news conference. They also emphasized that any health care providers who don’t want to participate can continue to be reimbursed for services. Shumlin conceded Wednesday that he remains disappointed that his hopes for universal health coverage, which he dropped just after the 2014 election, didn’t pan out. The waiver became his new priority. Both Shumlin and Gobeille said it’s clear something has to be done about rising health care costs. A platinum insurance plan for a family of four with a household income of $60,000 cost about $23,900 in 2015, Gobeille said. By 2025, at a 2 percent annual growth rate, that same family might have an income of $73,140. But insurance costs, if left unchecked, would increase at 6 percent to $41,253, he said. “The status quo is not going to allow us to prosper in Vermont,” Shumlin said.